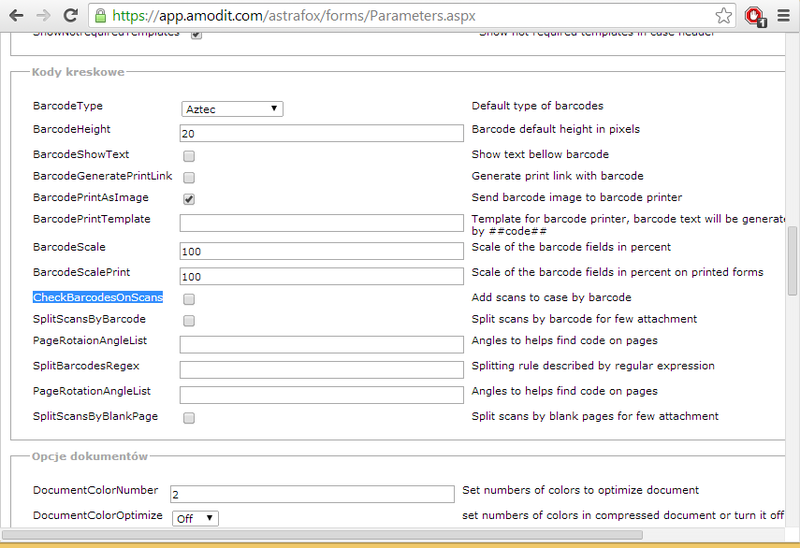 CheckBarcodesOnScans - turning this on means that AMODIT will look for barcodes on new scanned documents. When barcode is found then AMODIT is looking for a case which contains this barcode in title. This mechanism is searching only in titles, so usually you need to create automatic rule putting it into title from a field. This lets first put a sticker with barcode on paper document and creating cases with this code. Then you can scan all the documents at the same time and they will be automatically attached to proper cases. SplitScansByBarcode – this will turn on splitting documents using barcodes. You just need to place a barcode at first page of every document and scan them together. PageRotationAngleList - you can define angles to be used to rotate page before recognizing barcodes. By default only horizontal barcodes are recognized. Skewed barcodes are not recognized. TO recognize them you can rotate page by different angles. For example if you set this parameter to 10,-10,20,-20 means that first page will be rotated by 10 degrees right and left and if it is not enough it will try 20 degrees. Because of performance reasons you should not put many angles. SplitScansByBlankPage – mechanism similar to splitting by barcode but instead of barcode an empty page is used as divider.